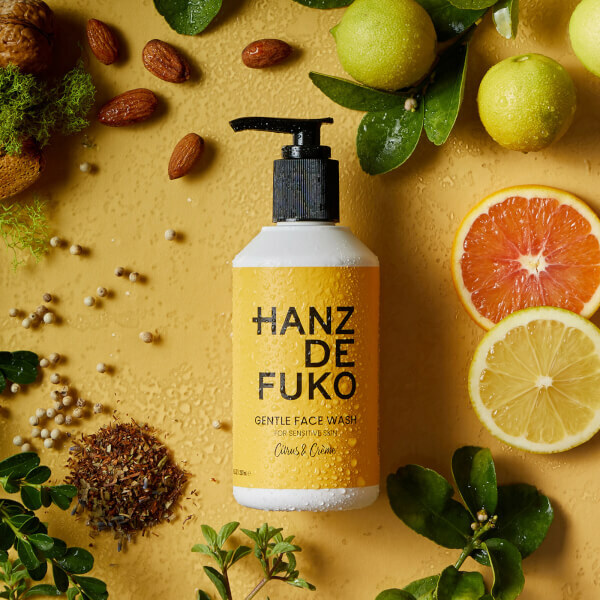 Soothe and clarify sensitive skin with Hanz de Fuko Gentle Face Wash, a lightweight cleanser powered by a blend of 12 natural plant extracts. The formula expertly lifts away impurities, excess oil and blemish-causing bacteria whilst replenishing essential moisture to maintain a healthy skin balance. 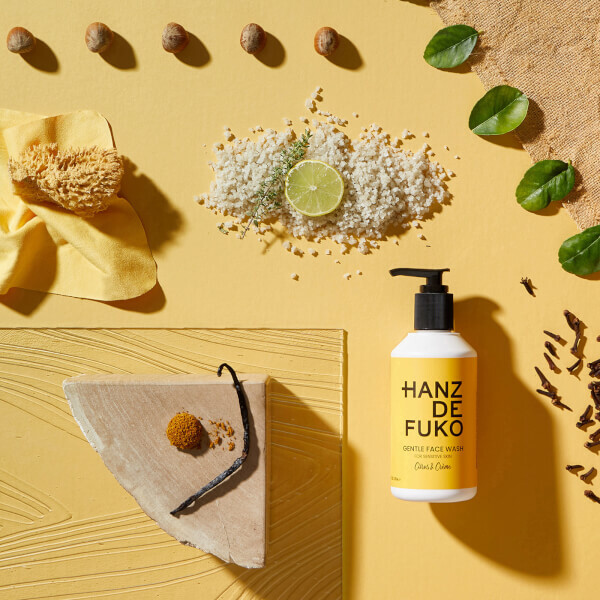 Rooibos Leaf protects against the damaging and ageing effects of free radicals, Pomegranate reduces the appearance of wrinkles and Aloe Vera combats acne for a more even skin tone and texture. After use, skin feels calm and comfortable and is infused with a radiant glow. Water (Aqua), Sodium Lauroyl Methyl Isethionate, Aloe Barbadensis Leaf Juice, Cocamidopropyl Hydroxysultaine, Disodium Laureth Sulfosuccinate, Sodium Lauryl Sulfoacetate, Cocamidopropyl Betaine, Sodium Lauroyl Sarcosinate, Aspalathus Linearis Leaf Extract, Glycol Distearate, Phenoxyethanol, Glycerin, Xylityl Sesquicaprylate, Fragrance (Parfum), Chamomilla Recutita (Matricaria) Flower (Chamomile) Extract, Sodium PCA, Tetrasodium Glutamate Diacetate, Panthenol (Pro-Vitamin 85), Coco-Glucoside, Glyceryl Oleate, Shea Butter Amidopropyl Betaine, Salvia Officinalis (Sage) Leaf Extract, Saccharum Officinarum (Sugar Cane) Extract, Pyrus Malus (Apple) Fruit Extract, Punica Granatum (Pomegranate) Extract, Hibiscus Rosa-Sinensis Extract, Eugenia Caryophyllus (Clove) Flower Extract, Citrus Nobilis (Mandarin Orange) Peel Extract, Althaea Officinalis Root (Marsh Mallow) Extract, Ethylhexylglycerin, Citrus Nobilis (Mandarin Orange) Peel Oil, Citrus Aurantium Amara (Bitter Orange/Petitgrain) Oil, Ascorbic Acid (Vitamin C), Lonicera Caprifolium (Honeysuckle) Flower Extract, Lonicera Japonica (Honeysuckle) Flower Extract, Palmaria Palmata (Red Dulse Algae) Extract, Opuntia Vulgaris Leaf Extract, Euterpe Oleracea (Acai) Fruit Extract, Camellia Sinensis (White Tea) Leaf Extract, Sodium Lactate, Arginine (L-Arginine), Citrus Limon (Lemon) Peel Extract, Aspartic Acid (L-Aspartic Acid), PCA, Glycine, Alanine (L-Alanine), Serine (L-Serine), Valine (L-Valine), Yellow 5 (Cl#19140), Threonine (L-Threonine), Red 40 (Cl#16035), Proline (L-Proline), Phenylalanine (L-Phenylalanine), Isoleucine (L-lsoleucine), Histidine (L-Histidine), Citric Acid.